1 bedroom plus hide-a-bed. Accommodates many kids. This loft, built in 2006, is a quiet retreat. It is a spacious 850 sq. feet, with a fully equipped kitchen and a sunset-view, covered deck with a gas grill. Downtown, Lake Coeur d'Alene, North Idaho College and City Park are all within a 2-10 minute walk. The Centennial Trail is within a block, and skiing is only 45 minutes away. It is a great launching pad for an active visit. David Groth, the owner, will do all he can to accommodate your needs! I am in my 34th year as an elementary educator, much of it in Coeur d' Alene, both as a teacher and principal. I love living in Coeur d' Alene and regularly take advantage of the lake, mountains, biking trails and the cozy downtown. I will do everything I can to make your stay a great one! Classy, comfortable, well-stocked. My favorite part of the loft? The west-facing deck, which feels like a tree fort. We cannot thank David enough for our wonderful vacation in Coeur d'Alene this summer. The loft was the perfect location for our family to enjoy a walk downtown, the beach, the Art Walk on the College campus and A Taste of Coeur d'Alene. The neighborhood is quiet and it feels very safe to walk around. We especially enjoyed the extra benefit of being able to use the kayaks and the garage for our car was a nice perk as well. 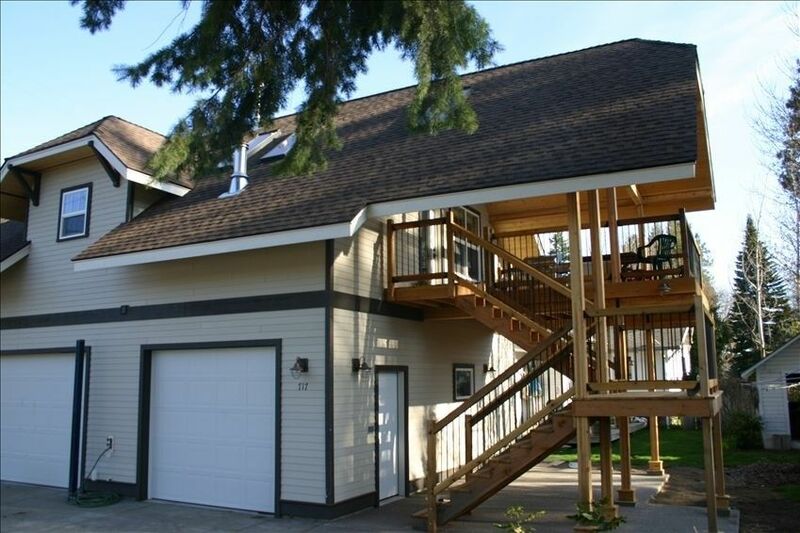 The loft is spacious and comfortable and we would recommend it to anyone vacationing in Coeur d'Alene! Thank you David; we hope to visit again soon! We had a wonderful stay in this loft! Really enjoyed Coeurdalene and staying close to the beach. The loft is comfortable and has great amenities. We will stay here again! Cozy place in a great location. My sons loved being in walking distance to the park and beach. They called it the Magic Treehouse and we all really enjoyed our stay. Awesome Place! Perfect for Iron Man Weekend! David was great to work with. He was very responsive to questions and allowed us to come early and stay later which was great since we only booked it for 1 night. The lake and park are only a couple blocks away so this made it the perfect place for us to stay for IronMan weekend. I competed in my first half IronMan and this place was the perfect spot to stay. Very quite and great part of town. I wish we could have stayed longer and we will definitely look into staying here again! David has kayaks, bikes, beach toys, etc that you can use in the garage. Very hospitable host and the loft is very open and inviting! Great to have you and your family! I hope you’ll come again. I have stayed at this property before and the place was well kept and clean. This time, it was not very clean, the floor was filthy and the washing machine had mold growing all inside of it. The dryer was filled with lint from all of the previous occupants who don't keep it clean and I was a bit scared to use it as that is how fires start. The worst part is that as a busy professional I only get 2 weeks of vacation per year and Dave decided to work on his unit in front for the entire two weeks. Most days I got woken up at 6:30 am by cement pourers, pressure washeres, , drills, sanders, etc. And this went on all day. I was not able to relax or even sleep in until 8 am. And he wsa just preparing it for another VRBO for his own pocketbook. Very inconsiderate. The only reason I gave it 2 stars fwas because of the awesome location but the entrance is through a junky alleyway. My goal is to enrich people's vacations, not to be a big negative. True: I was nearing the end of a three month remodel of my house and on some mornings I didn't stop the contractors from starting early. I should have. And yes, there was work during other parts of the day. Cleanliness? I had the same cleaning crew as the first two times J and A were guests. Apparently I didn't do a good job of quality control. I'm sorry this was a negative experience. A refund will go in the mail this week. Centennial Bike Trail passes within two blocks of the loft.